I’ve not watched a whole bunch of kids TV lately. You hear yourself telling some confused inebriate at a party you’re interested in the supernatural, mythological and metaphysical in children’s television drama once too often and you kind of get to thinking maybe you should broaden your interests a bit more. I did however attempt to purchase the second series of Shadows, the 1970s Thames TV spookfest as a birthday treat a couple of months ago. Season 2 is no place to start any series, but Shadows is a supernatural compendium, essentially a TV version of those great ghost story anthologies you sometimes uncover in charity shops with a picture of an angry black cat or a skull with a candle in it’s eye on the front, so I figured it was okay to start in the middle. There was also one story in particular I was keen to see from Series 2 called Time Out of Mind by Penelope Lively. The Revenge of Samual Stokes by Penelope Lively, so good I wrote my name in it twice. 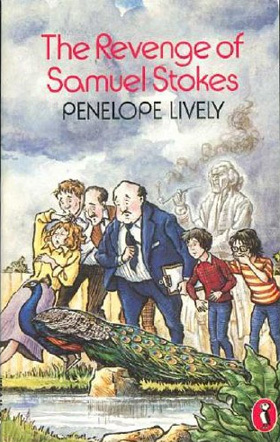 Before she was a terribly serious credible adult writer Penelope Lively wrote a lot of books for children. In a Guardian interview from 2009 she described most of these as “crap, honestly”, but my ten year old self would have been incredulous at such a suggestion, had I known what incredulous meant. The Revenge of Samuel Stokes was my introduction to Lively and from then on all pocket monies for the foreseeable future were dedicated to the pursuit of getting my hands on as many of her books as possible and bloody hell, I really treasured those books. Once my collection was amassed each of my Penelope Lively books had a ’This book belongs to’ sticker affixed perfectly symmetrically inside the front cover, name carefully inscribed with a calligraphy pen in my best handwriting. Written in 1981 The Revenge of Samuel Stokes is a highly enjoyably but slightly silly book, a idiosyncratic ghost story not dissimilar in tone to her best known and most critically acclaimed children’s novel, the Carnegie Medal winning Ghost of Thomas Kempe, written 8 years earlier. Looking at her writing chronologically the Revenge of Samuel Stokes was at the point of publication one of her lighter kids works and signalled a shift into more whimsical territory, with a lot of her writing for children after this targeting a younger demographic. Proceeding this however in the early to mid seventies was a pretty hefty body of work largely much more serious, and usually with a strong historical grounding. I couldn’t get enough of it. It’s only with retrospect that I can see that Lively sowed the seeds of interest in all things uncanny; folklore (the Wild Hunt of Hagworthy), deserted villages (Astercote), stone circles (the Whispering Knights) and haunted houses galore. With sensitive, intelligent, ponderous heroes and heroines Lively wrote perfect supernatural children’s fiction crying out to be dramatised. The 1970s and 80s were a good time to be writing fiction for kids in the UK. A wealth of children’s publishing imprints – Fontana Lions, Armada, Puffin – meant a market buoyant with new writing as well as reprints of children’s classics . This in turn fed into television, with not only more screen time devoted to kids, but the funding to match. All of which begs the question why so little of Penelope Lively’s work was ever televised. An original series for Yorkshire TV, Boy Dominic, was Lively’s first TV work, followed by the aforementioned episode of Shadows, but of her books only two were ever adapted for the small screen, her first novel Astercote, lost in the BBC vaults since the turn of the 1980s, and a US version of the Ghost of Thomas Kempe produced by ABC. Seems like everyone was too busy re-adapting Tom’s Midnight Garden every five friggin’ minutes to see the potential under their noses. But hey they’re great books, they can always be adapted in the future and hopefully some of them will one day, in the meantime I recommend giving yourself a break from worthy adult novels and getting a copy of something Lively wrote for children. Perhaps even write your name in it. ~ by hazyhazy on April 18, 2013. I’m glad I found this blog, as you and I seem to share very similar interests (my Alan Garner/Penelope Lively/Susan Cooper/Diana Wynne Jones obsession was such that I wrote a long book about the four of them in 2006, and I’m very fond of some of the ’70s dramatizations. I was a bit shocked that PL had called her books “crap”, but I see from the source that she only really applied that to the ones pre-Thomas Kempe (i.e. Astercote,The Wild Hunt of Hagworthy, The Whispering Knights, and The Driftway). I still think that’s a bit harsh – especially in the case of The Whispering Knights – but her best books for children definitely came after.